on the street, having conversation. I drop my eyes and rest boyishly on my hands, I slowly near my building. Stillness. I don't have to speak. You're No. 7, she said. I pay attention. this sets me free. Like meditation. "The cut-up technique was invented by Brion Gysin January 19, 1916 - July 13, 1986 who was a painter, writer, poet, and performance artist born outside of London. This technique is also known as fishbowling, is an aleatory literary technique, or genre in which text is cut up at random and rearranged to create a new text." Gysin introduced writer William S. Burroughs to the technique at the Beat Hotel. The pair later applied the technique to printed media and audio recordings in an effort to decode the material's implicit content, hypothesing that such a technique could be used to discover the true meaning of a given text. Burroughs also suggested cut-ups may be effective as a form of divination saying, "When you cut into the present the future leaks out. "Burroughs also further developed the "fold-in" technique. Thanks for stopping by! My other blogspot: ThE ArTfuL EyE"
A most excellent dissertation on the subject. Very well written. An A++++ in my book. Andrea, you are something else!! That sounds extremely inviting to try! I love the serendipity of it all! 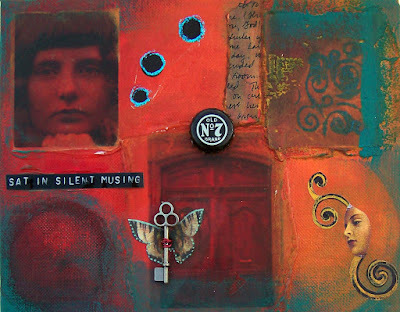 Love the musing figure in your collage. That is very interesting and something right up my alley. I had never heard of it, but somehow it seems very logical and good to implement and very much something I want to do. I love the products of "accidents" and I like the unexpected very much when it comes to prose and poetry. It gives me a thrill.I am going to those sites right away. Thanks for pointing me in this direction. As to the collage itself; I enlarged and had a good look. Lovely colors and lovely elements. Yay, real canvas board, clearly visible. The composition is very lively and my ewye keeps moving alert and pleased....muy muy bueno. The prose also inviting and kept my ADD eye focused....intellectual boston creme donut of sorts. Fantastic and beautiful. I love the woman in the lower right corner, with her eye on the key that is flying away on the butterfly. The key to what? I wonder. The Burroughs quote is great! Is that a small enbryo at botttom left - obscuredby pigment? I love the deep colors and the lingering aire of questions un-answered here! Very nice! love the illustration too, your colours are bold and beautiful. I have done this style of poetry before but we called it something else...can't remember what though! I found it hard intially but once I finally got going I did 3. Illustrations were no where near as good as yours though! I love the colors of this piece.